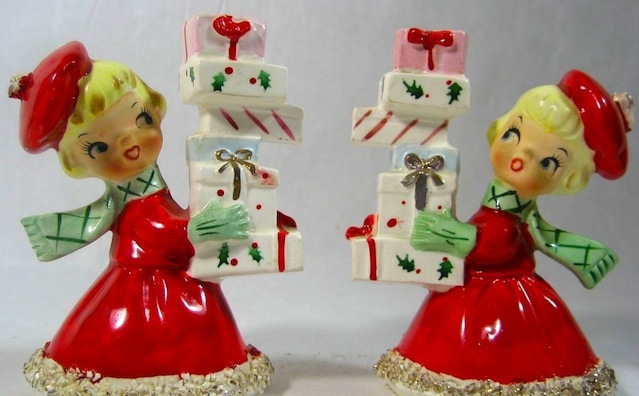 This is the time of year when we are all looking for gifts for our loved ones and friends and sometimes it seems that the ones with a passion for vintage, mid-century modern, and collectibles are the toughest ones to shop for and much of our shopping is done in antique shops where All Sales Are Final. We are thrilled with our fantastic finds for that “someone special” until we get them home and then the dreaded “Oh No”, why didn’t I notice that before I bought it, comes out. So, to save you some of the grief of the dreaded “Oh No”, below are 5 of my tips for holiday shopping in antique shops during this time of year. 1. Make sure you REALLY examine the item. Feel around the edges and nooks and crannies for chips, dings, fleabites and repairs. 2. Have good lighting so you can see if paint color is missing or has been colored over with a Sharpie. 3. If there is tape on the item remove it enough to get a good full look of what is underneath. Learn from my misfortune. I recently purchased a gorgeous jam jar that had the lid taped on and when I got it home and took the tape off there were several cracks inside the jar and this was not disclosed on the tag and I would have seen this had I lifted the tape and looked inside the jar. 4. If an item has the price tag tied on make sure to look all around and under the tag. Again, learn from my misfortune. I recently purchased a lovely vintage figurine from an Antique mall and the figurine had a price tag securely tied to the arm. When I got home and removed the tag is when I noticed the arm had been broken and re-attached and the string was covering this repair up. 5. Smell your item(s). I know this sounds strange but smell your item. You would be amazed at the coats of paint and varnish vintage items receive prior to being put up for sale. To me, this is not ok when I am being lead to believe that I am purchasing a truly “vintage” or “antique” piece. If the seller has re-furbished the item they should state it on the tag. Also, varnish and paint can have a lingering odor for many days and if you intend to be giving the item as a gift the last thing you want is for your recipient to open it and be assailed with a whiff of varnish or paint. I hope you find these tips helpful. Happy Holidays.